This is the first of my Polished Aluminum Hand Crafted PAPER ORGANIZERS. Brand new product for NoseArtDisplays .com inspired by World War Two Bomber technology. 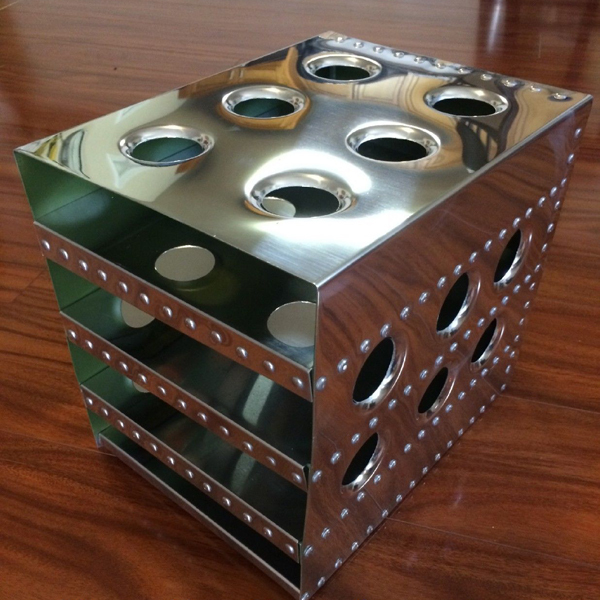 Fabricated from polished .040 thick, 5052 series aluminum and constructed with over 200 solid aluminum rivets as well as 18 inch and a half lightening holes. 4 shelves that can slide in and out, allowing you to organize your photo paper, paper, reports, etc. This project is very time consuming and therefore my labor is expensive, but this is the first of it’s kind in the world. It has it’s share of patina, slight flaws and other details that were common in that era. 3 shelves are polished aluminum, bottom ‘shelf’ is fixed, interior is painter period correct Green Zinc Chromate which you will often see to protect interior aluminum inside of wings and in the interior of Bombers and fighters of World War Two. Free Shipping via Fed Ex ground in the lower 48 states. Actual shipping charges outside of the USA. Approx 9″ wide, 12″ long and 11 inches tall. Weighs just a few pounds. A real eye catcher on your desk!